Blue Oyster Cult‘s Tyranny and Mutation. Aerosmith‘s Rocks. UFO’s Phenomenon. The Montrose debut. Back in the early to mid-’70s those albums forged a sound that critic Lester Bangs called “heavy metal”. They were dynamic and forceful, fast, loud, and proud. 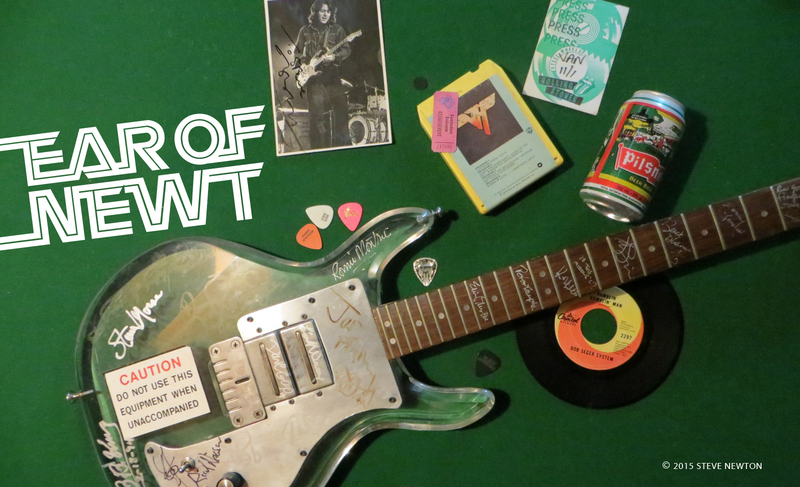 The bands that made them had super guitarists like Buck Dharma, Michael Schenker, and Ronnie Montrose, and great vocalists like Eric Bloom, Steven Tyler, and Sammy Hagar (he was better back then, beiieve me). Bands of that calibre were few and far between, and seventies “metal” fans cherished the high-energy rushes that tunes like “The Red and the Black”, “Sick as a Dog”, “Rock Bottom”, and “Rock the Nation” could provide. Nowadays, those bands would fall under the “hard rock” category. 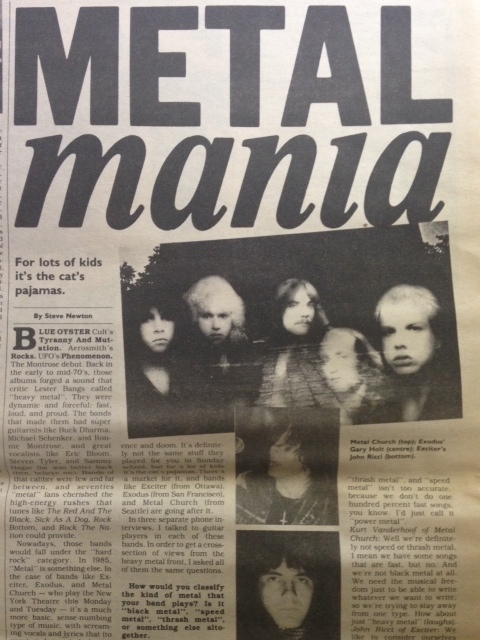 In 1985, “metal” is something else. 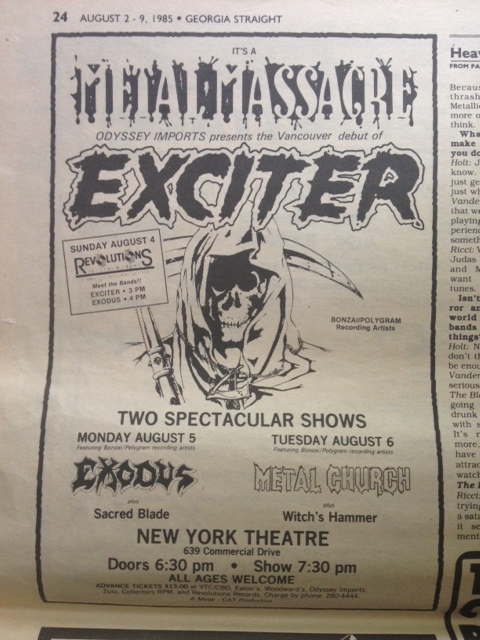 In the case of bands like Exodus, Exciter, and Metal Church–who play the New York Theatre this Monday and Tuesday–it’s a much more basic, sense-numbing type of music, with screaming vocals and lyrics that (to varying degrees) deal with death and destruction, violence, and doom. It’s definitely not the same stuff they played for you in Sunday school, but for a lot of kids it’s the cat’s pajamas. There’s a market for it, and bands like Exodus (from San Francisco), Exciter (from Ottawa), and Metal Church (from Seattle) are going after it. In three separate phone interviews, I talked to guitar players in each of these bands. In order to get a cross-section of views from the heavy-metal front, I asked all of them the same questions. How would you classify the kind of metal that your band plays? Is it “black metal”, “speed metal”, “thrash metal”, or something else altogether? Gary Holt of Exodus: I don’t really like the term “thrash metal”, and “speed metal” isn’t too accurate, because we don’t do one hundred percent fast songs, you know. I’d just call it “power metal”. Kurdt Vanderhoof of Metal Church: Well we’re definitely not speed or thrash metal. I mean we have some songs that are fast, but no. And we’re not black metal at all. We need the musicial freedom just to be able to write whatever we want to write, so we’re trying to stay away from one type. How about just “heavy metal” [laughs]. John Ricci of Exciter: We like to consider ourselves like a “power metal” band. Because it’s not really thrashy like Slayer or Metallica or Anthrax. We’re more of a melodic band, we think. What drives you to make the sort of music you do? Holt: Just the intensity, you know. It’s so intense, and it just gets the blood goin’. It’s just what we like to play. Vanderhoof: Just the fact that we enjoy hearing it, and playing it. It’s quite an experience to be able to play something that powerful. Ricci: Well our influences are Judas Priest, Black Sabbath, and Motorhead. We just want to write good fast tunes. Isn’t there enough horror and violence in the world already, without bands that focus on those things? Holt: No, I don’t think so. I don’t think there could ever be enough. Vanderhoof: If you take it seriously, yeah. I mean “In The Blood” is basically about going to a bar and getting drunk and getting in a fight with somebody, you know. It’s not saying anything more. It’s something we have fun with, for the same attraction that you want to watch a horror movie, like The Exorcist or something. Ricci: Well we’re desperately trying to get disclassified as a satanic rock band, because it seems every time you mention Exciter people mention Slayer and Venom and all this. Are you intrigued by horror, whether it be in movies or books? Holt: Yeah I am. Very much. As far as movies go I’ve seen just about all the really classic horror movies, stuff like Evil Dead, Maniac and Bloodsucking Freaks. You know, Gates of Hell, all the really good gut-spitting, head-ripping kinda stuff. That stuff inspired me a lot. For books, I’ve always liked Edgar Allan Poe and H.P. Lovecraft. And any good satanic books about witchcraft and black magic. Vanderhoof: I get a kick out of them; I think they’re funny. Here again, if you take it real literally, you can really get lost in it. Ricci: Well no, not at all. We just write the lyrics because they correspond to the heaviness of the music. That’s the only reason. We’re not trying to give the kids a message or anything like that. Holt: Bach and Beethoven and Vivaldi. And as far as metal goes, Ritchie Blackmore, Gary Moore, and live Jimi Hendrix kinda stuff. Vanderhoof: As far as heavy metal’s concerned, it would be the basics: Motorhead. And I’m really into late-seventies punk. Ricci: Well the guitar player from Black Sabbath, Tony Iommi, I like a lot. And I like the guitarists from Judas Priest, K.K. Downing and Glenn Tipton. And that’s pretty well it. What do you think of “mainstream” metal bands like Motley Crue and Ratt? Holt: Ratt I don’t mind too much, they have some good guitar playing and some really good production on all their records. But Motley Crue, I really can’t say enough bad things about them. They don’t have any talent, you know, yet they continue to make lots of money. The only person who’s halfway talented is Tommy Lee, the drummer. Ricci: Well we don’t have anything against those bands, you know. They’re kind of a different type of heavy metal than we are–and they’re more successful at it. But we’re positive that for the kind of music we’re playing there’s a market out there to make a solid career out of it. That’s the whole idea. What do you think of Wham!? Holt: Wham!? [laughs]. Someone needs to lower the bam on Wham! Vanderhoof: I don’t think of them, you know [laughs]. I really don’t. Here again, it’s like another formula band, but on a totally different level. But I don’t care [laughs]. Ricci: Wham!? You mean those two guys? Well they’re kinda like a Hall & Oates clone, but they’re a good band. This was an awesome read! Thanks for posting! I still love to read articles from my collection of metal magazines from the 80’s and 90’s.